I don't normally think of myself as being a Luddite. I love the internet and lots of different technologies and think we're materially much better off now than we were 50 years ago. But sometimes I hate the homogeneity of life in the 21st century. It's all become just "the same" everywhere, hasn't it? In my home town of Dundee they took to knocking down historic old buildings in the 1960s and continued the practice through to the 1990s. Those buildings that could be made into something else, i.e. old jute mills converted to flats, were done up, completely ruining their character and any historic atmosphere they once exuded in the process. Those buildings less fortunate were simply bulldozed only to be replaced by a modern structure that ruined any sense of place that part of town once possessed. Sometimes I think that architects were some of the biggest vandals of the 20th century. 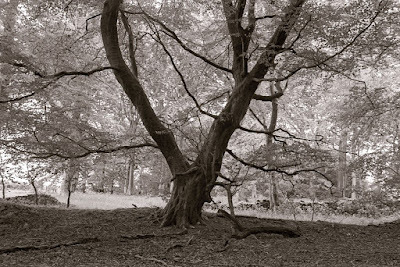 Consequently, a lot of my photographic excursions are in search of something old, a quest that has seen me scouring the narrow roads and byways of the Angus hinterland. Only occasionally do I stumble upon something quaint and characterful. 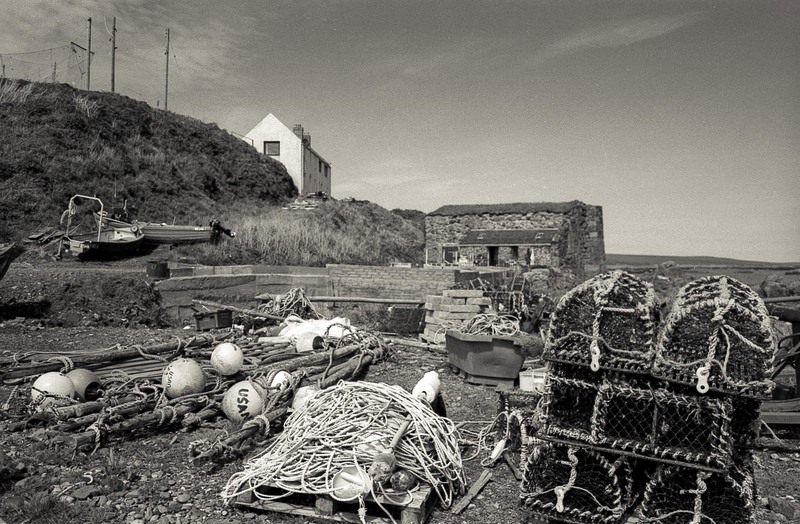 One example of that was Fishtown of Usan, another one of those once bustling villages that line the North Sea coast in this part of the world. I still remember the first time I drove into Fishtown about 15 years ago. Ramshackle would be the best word to describe it. There couldn't have been any more than a dozen or so houses and a few derelict cottages. Nearer the shore there was an interesting old tower, once used to signal to ships out at sea, with a few old cars scattered around. I remember looking through the window of a shed and seeing an old motor from, it must have been, the 1940s. 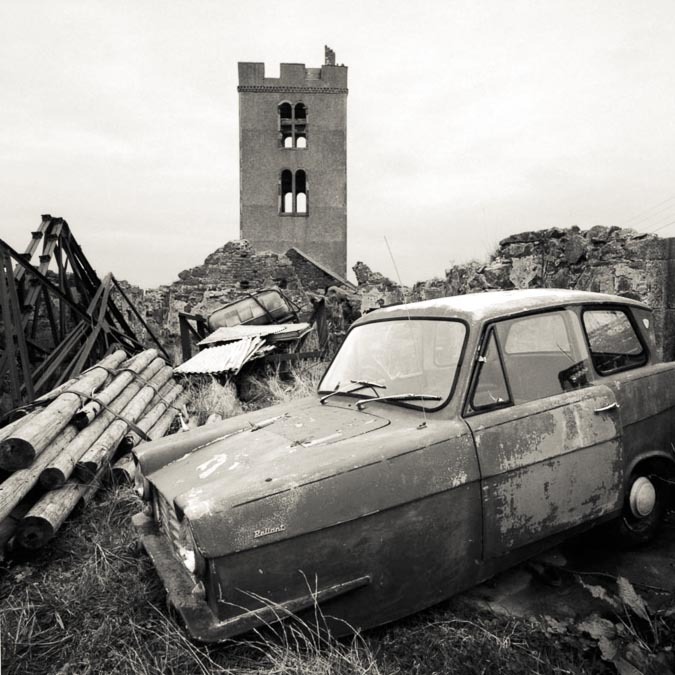 At the base of the tower was a Reliant Robin. 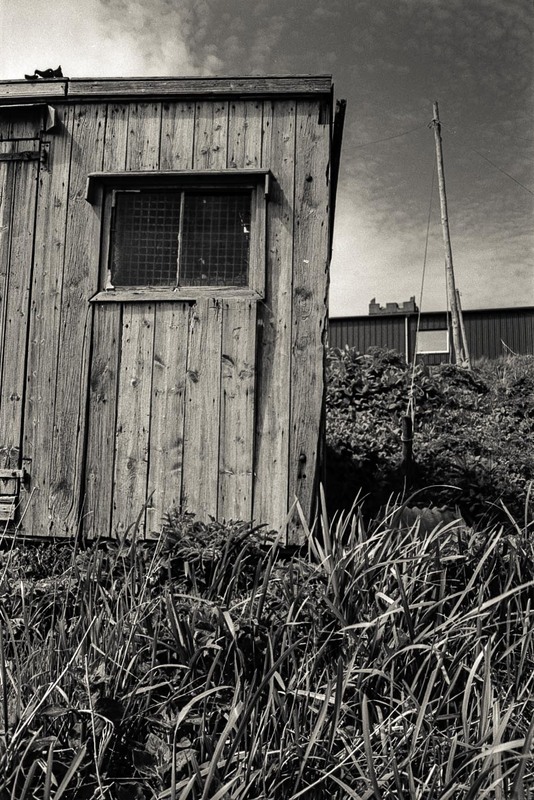 Some old, weathered sheds, which once performed an unspecified roll in the local fishing industry, were decaying gently in the salt-laden onshore breeze. 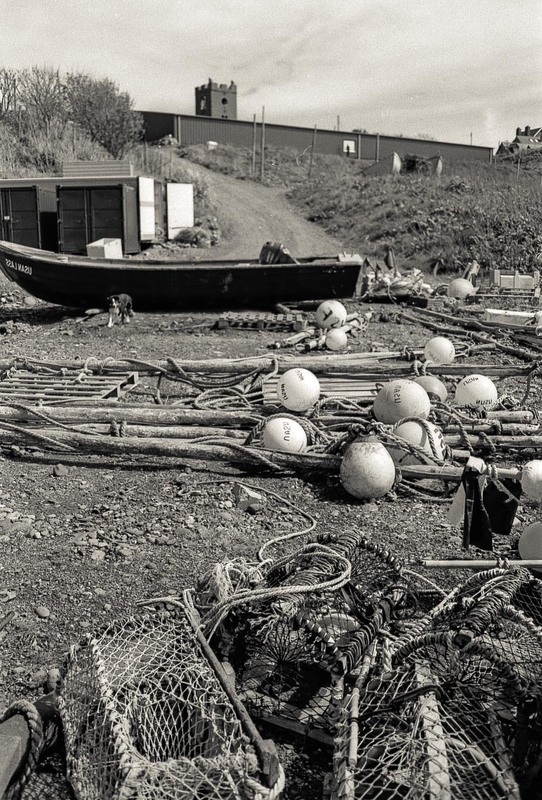 Fishtown was a little moment in time, unrestored, full of charm, still inhabited by the ghosts of centuries of old fishermen and women. I had great fun photographing the place and spent a few minutes chatting to an old lad who lived in one of the terraced cottages and who was quite happy for me to go poking around his land. Over the years I made a couple of return journeys each time enjoying the unique atmosphere, the peace and quiet. Then, a couple of years ago (I wrote a little about it here), I went back to find that a new owner - I assumed it was a new owner - had decided to inject some life into the old place. This took the form of a really ugly, modern farm building - a fish processing shed I guess - right between the tower and the old sheds near the shore. Well, that pretty much killed it for me. Take a look at the pic below I took during my first ever visit. I shot that on a 6x9cm Mamiya Press with 65mm Sekor and HP5 developed in Perceptol 1+3, my favourite combination at the time. The sea was just a few feet behind me. 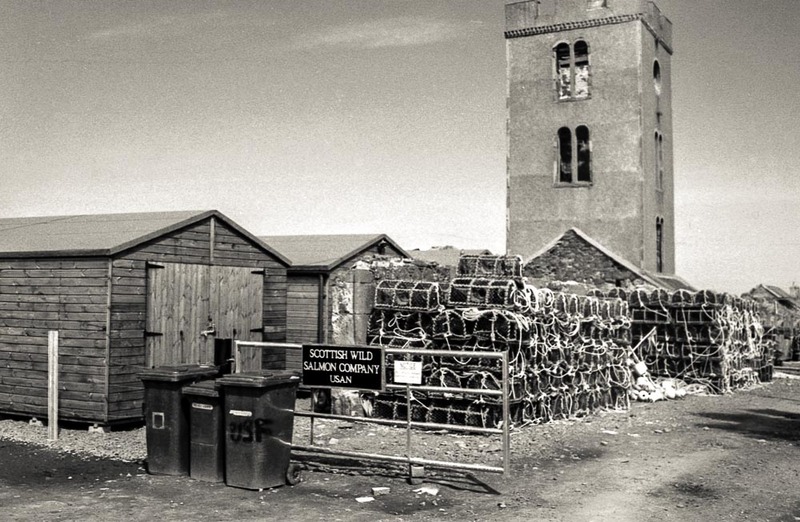 It shows some of the lobster creels with the old sheds in the middle distance and the tower in the background. 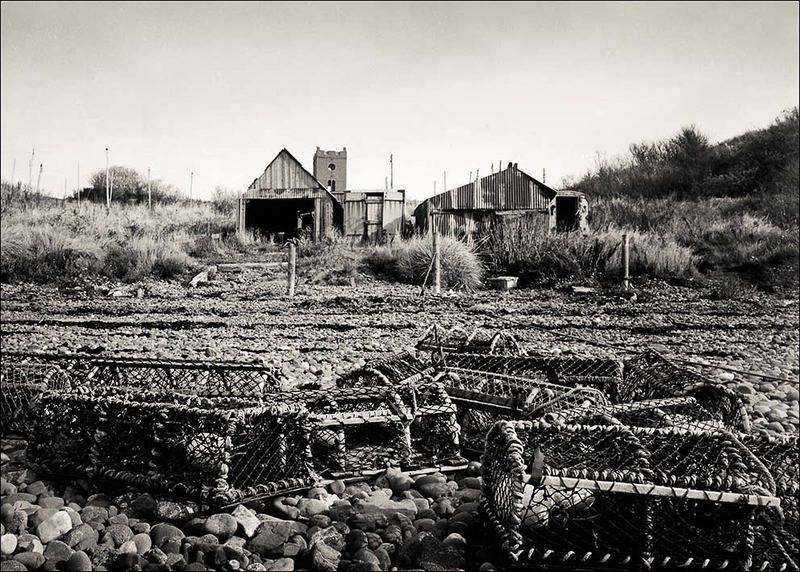 The same view now features the modern fish processing building just behind the sheds, completely destroying the olde worlde view. I haven't got a photograph from the same spot but here's a similar view showing the new building. In the flesh it's much worse than it looks in this image. Whilst the Mamiya pic could have been taken at any time during the preceding 100 years, the charmless hulk marks the shot below as something from a less aesthetically-pleasing era. And the Reliant Robin (below) that had enjoyed an incongruous position almost in the shadow of the tower? Someone thought it would be a good idea to tow it away and replace it with three smart-looking wooden sheds instead. I don't want to romanticise this too much - maybe I've already done so - but stuff from the 1980s onwards is just horrible to look at! Whether it's cameras (some Leicas excepted), cars or buildings, they add absolutely nothing to a cityscape, landscape or photograph. Perhaps it's wrong of me to expect that an odd wee hamlet like Fishtown of Usan should remain in some sort of time warp just for my edification but the alternative is that anything with some historic charm is at risk of being gentrified to death - or at least to the detriment of the nation's built heritage. Logically, since most things - even well-maintained properties - are effectively in a process of delayed decay there will always come a time when they are knocked down to make way for something newer. But why unduly hasten the process? The following shots are from a recent trip back to Fishtown. Hopefully, they still capture a little of the timelessness that was once so palpable. 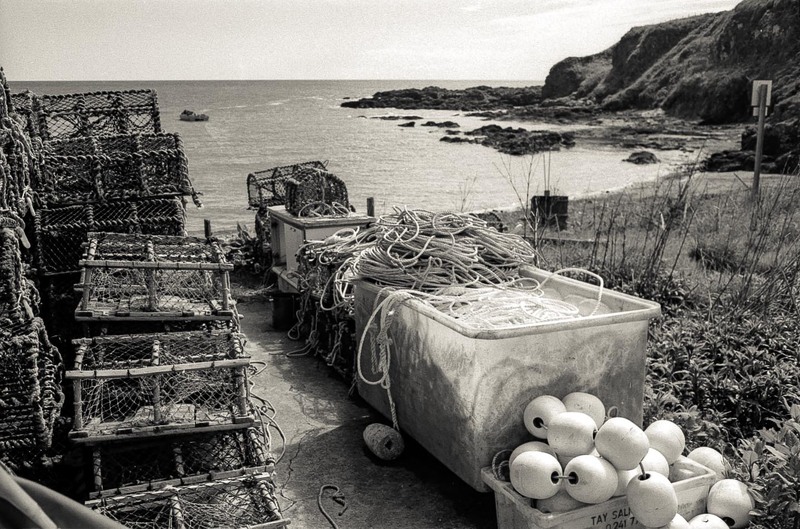 They're from the same roll of film as the Lunan Bay set. Once again, Adox CHS 100 II looks superb developed in Spur's HRX fine grain developer. I've noticed that it also scans very well, too. 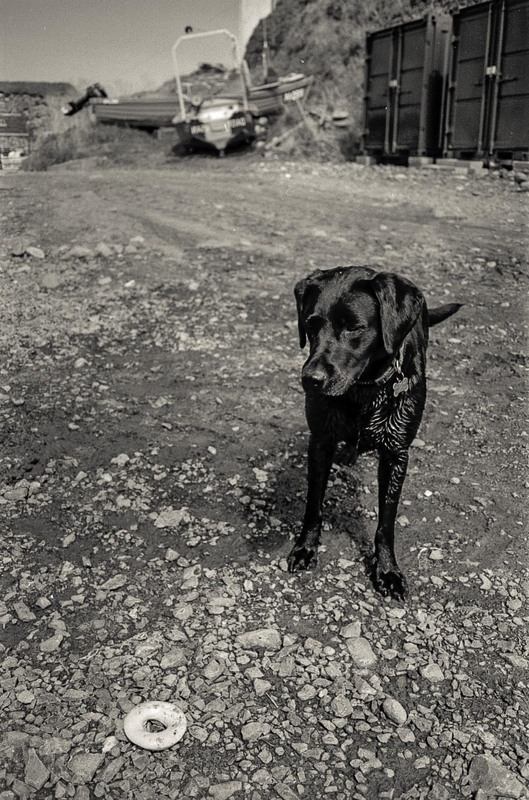 The photo of the dog was just to show you one of the nicest aspects of Fishtown. He featured in an earlier post I wrote about the village although there was no picture of him. On a previous visit, he thought it was fun to stick his head up the back of my coat between my buttocks and push me along the road. I could hardly stop laughing. I gave him the nickname "Nuzzler". When I'd finished taking photographs and returned to the car, he decided to jump into the boot with a look full of anticipation on his face. He's a lovely animal with the typical Labrador nature. On my latest trip, he seemed to have been cured of his dodgy nuzzling practice and instead wanted me to throw the plastic ring in the foreground of his pic for him to fetch. We did that for a few minutes but this time he didn't follow me back to the car. Yet another custom gone by the wayside. I think the word you used 'homogeneity' sums it all up for me. I'm not against change as such, it's just that at some point everywhere up and down the country is going to end up looking the same. High Streets are almost there already and the more remote places seem to be catching up. It's very sad for those of us who enjoy regional differences. Couldn't agree more, Michael. I want to spend a couple of weeks taking pictures in the far north-west of Scotland as it looks pretty unchanged up there (relatively speaking). Yes, California is young and all the same. But there are still some out of way places like Locke, CA (USA). It was a Chinese town on a major river. In the late 1880s until the 1920s maybe 30s, the Chinese were, shall we say happier, living on their own. Now it is mostly hippies, with a few Chinese still living there. Like your Usan, it is a great unchanged place for photography. This sort of change is inevitable Bruce, however despair not . . there are bits of Scotland that have barely changed since the '60's/'70's . . you just have to search them out. Bruce I agree with all you have said planners just destryoy the character of the place which has continued to evolve as the past commercial works fall into disuse. I suggest you come and visit Caithness we're so isolated nobody thinks its worth developing so the past remains with some amazing sights. Its worth the long trek and maybe a couple of days stay to search the places out. "...stuff from the 1980's is just horrible to look at! Whether it's cameras..."
A Nikon F with the plain prism, a Spotmatic, an OM-1, etc just 'look' right. Just compare the Canon F1, with it's squared shoulders and direct controls with a later T90 with it's melted plastic blob look. Everyone says it was a very advanced and capable camera but styleing? Yuck! After the T90 Nikon followed along in the 'melted plastic blob' look of camera design. Now digital has made it worse as every available surface is festooned with some button or control. Ok, got to go fondle my OM-1 and calm down.